Colorado Animal Rescue (C.A.R.E.) has helped thousands of local pets find new homes since the facility in Glenwood Springs opened its doors in 2000. 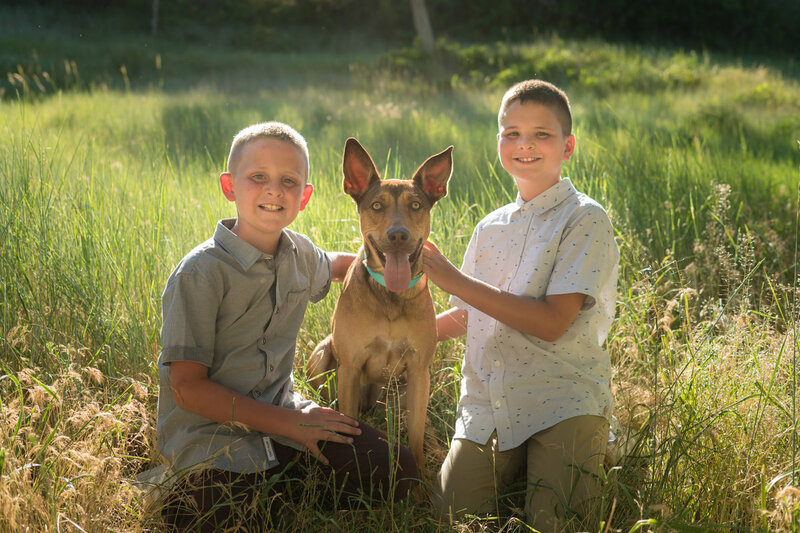 Tracey Yajko, the shelter’s lead canine behavior specialist and community outreach coordinator, sat down with some recent adopters to chat about the many reasons why they love their rescue pets! To learn more about C.A.R.E.’s events, volunteer programs, and animals currently available for adoption, visit ColoradoAnimalRescue.org or follow the shelter on Facebook and Instagram. The Valencias of Rifle, including brothers Adrian and Oscar, adopted dog Cloe in February 2017. What was your favorite part about adopting? Brothers: We would go to C.A.R.E. every week to walk dogs, never with the intention to adopt. Then we met Cloe, and she adopted us! It was an amazing experience. Why did you decide to adopt her? Brothers: She decided it for us! We met her and put the application in to hold her, and went back the next day with our whole family and everyone was sold. What’s the funniest thing you’ve done with your pet? Adrian: When she goes over to the neighbors house and waits at the door for the neighbor’s dog to come and play. Oscar: When she plays hot potato with her treats, she throws it around and plays with it before eating it. 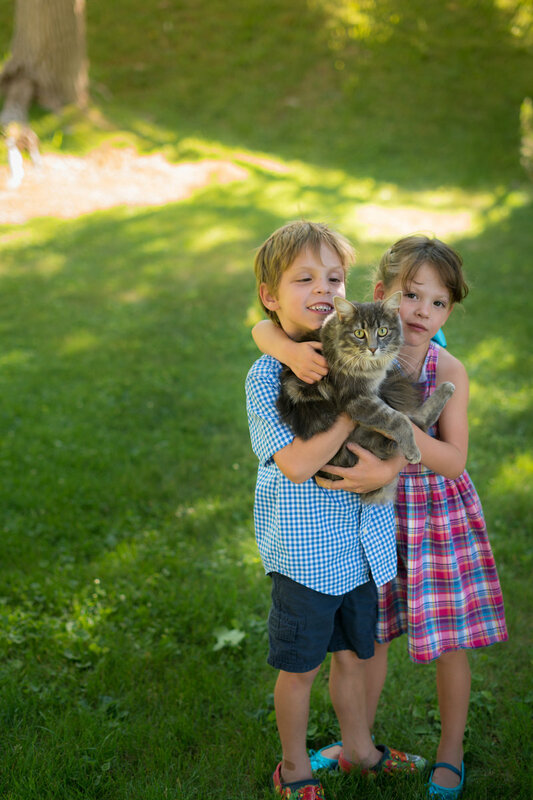 Do you think it’s important for kids to grow up with a pet? Oscar: Yes because they learn responsibility, and that’s important when you grow up and have a family. What is great about living in the Roaring Fork Valley with your dog? Adrian: Yes, she will go through all the tricks she knows when my Dad gets some cheese out, without saying anything. 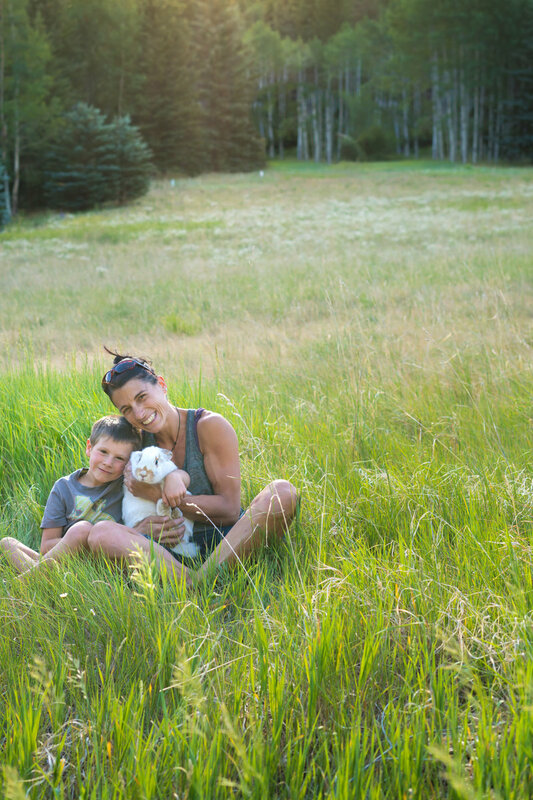 The Couvreux family of Redstone, including mom Chloe and son Tao, adopted two-year-old bunny Chancellor in May 2018. What was your favorite thing about adopting from C.A.R.E.? Chloe: We loved the idea of adopting a pet who needed a home. My son’s favorite part is that he was “rescuing” a bunny; my favorite part was knowing that this bunny had been checked out by a vet and was healthy. Everything at C.A.R.E. felt right. I sent an email and someone got back to me right away. The staff was really welcoming and knowledgeable, and the animals looked happy. It was a no-brainer! Why did you decide to adopt this pet? Chloe: The fun answer to why we picked a bunny is that our son Tao told us: “For my birthday I would like either a puppy, a baby sister, or a bunny.” After a visit to Rock Bottom Ranch, he really became serious about the bunny, and we decided we would do it for his birthday this year. I had said that to a friend, who one day sent me a text and told me C.A.R.E. had a bunny! We went the next day, and Tao fell in love with this bunny. We visited one more time, got everything we needed ready, and took him home the next week. 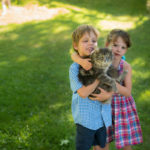 Do you think it is important for kids to grow up with a pet? Chloe: I do. I think it teaches responsibility and empathy for others, and more specifically so for fragile beings who depend on you. 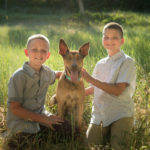 Playing outside so much and living in the Roaring Fork Valley, both our boys are in tune with protecting nature, the environment, and caring for the animals who live in it. Having an animal and feeling you are responsible for his well being is a big deal for a little kid. The Taglers of Glenwood Springs, with mom Mindy and twins Winnie and Will, adopted cat Pickle and dog Fergie from C.A.R.E. in recent years. Twins: Because they protect us and we love them. Mindy: To complete our family. How did you know that Pickle was the right cat for your family? Mindy: My son selected a kitten to take to C.A.R.E.’s annual blessing of animals that’s held every fall. He carried her out and sat with her through the whole event. I knew this kitten (Pickle) was something special and would be the perfect fit for our family. How did you come up with your cat’s name, and does it have any special significance? Twins: We listed a bunch of names we like and when we got to Pickle, it just fit. Mindy: I call the kids my Peanuts, so Pickle was the next best thing. What’s the funniest thing you’ve ever done with your pet? Twins: Dress them up for Halloween. Mindy: Yes. Pets teach kids love, compassion, and responsibility. They also provide companionship and make great playmates. 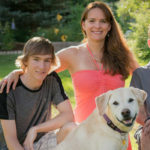 What is great about living in the Roaring Fork Valley with your pet? Mindy: That we get to take our pet on 99 percent of our adventures! Is your cat smart? How can you tell? Twins: Yes, because she is so cute. Mindy: She must be smart, because she got me to take her home! Twins: We like to snuggle with Pickle and our dog Fergie. 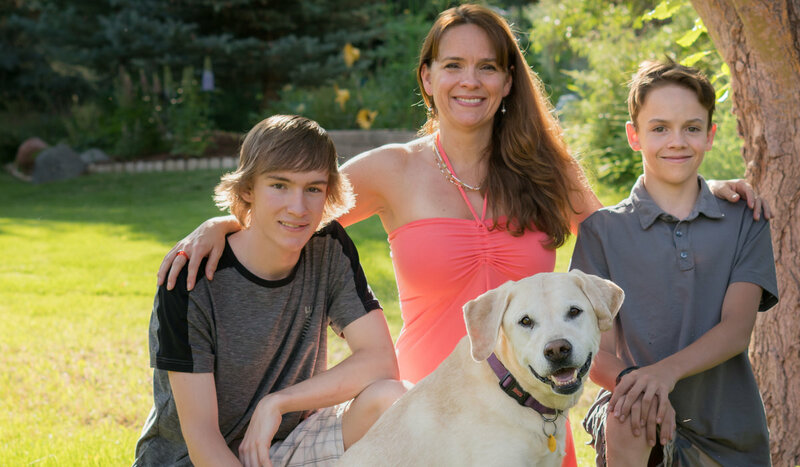 The Hadsocks of Glenwood Springs, including mom Theresa and brothers Tanner and Hunter, adopted dog Harrison in August 2012. They fostered Harrison before adopting him, and are now currently fostering a new kitten named Tic Tac. Why did you decide to adopt Harrison? Theresa: We were a foster family to Harrison after the Thumper Fund paid for Harrison to have hip surgery on his left side. Harrison was to stay with us and receive physical therapy on his hip while recovering. One reason we decided to adopt Harrison was because even when he had 30 staples in his hip, he was great with our entire family during physical therapy. Harrison did not start walking on his leg until six weeks after surgery, yet, he remained happy and patient the entire time. How did you know that Harrison was the right pet for your family? Theresa: When others were filling out adoption applications for him and we started panicking. We were already deeply in love with this dog and he was ours. Foster failure at its best! Theresa: Harrison loves to travel. We travel for hockey, lacrosse, and baseball as a family. When games are local or the hotels are pet friendly, we bring him along. He sees his gear being packed, gets in the car, and will not get out until we arrive at our destination. What is the most rewarding thing about adopting a pet from C.A.R.E.? Theresa: C.A.R.E. helped our family during a difficult time. We saw an ad in the paper that C.A.R.E. was looking for families to love and foster kittens. I thought the boys might benefit from something to love, cuddle, receive affection, and take care of while we were going through a transition.